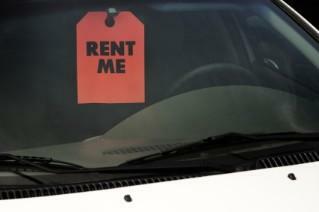 Don't pay full price for rental cars. While a straight booking quote may sound sky high, you can often bring the price down considerably by using some strategies. Comparison Shopping: Do some comparison shopping online before you book your rental car. Look for the best deals at travel websites like Orbitz and Travelocity along with special offers, coupons and rates from name brand websites like Hertz and Budget. Multiple Travel Bookings: If you're booking your flight or hotel online, check to see if you can add a rental car for a low additional fee. Always read the fine print and compare to coupons to see if you are saving the most you can before clicking the purchase button. Frequent Renter Clubs: If you do a lot of traveling, it may be worth joining a frequent rental club or program. You can often get special insider coupons, rates, specials or upgrades just for joining. Sometimes discounts kick in after a certain number of rentals. Simply call customer service for rental car companies you use regularly, or ask at the rental desk. See if your employer has a program too. Other Membership Discounts: Ask about rate discounts for being a member of clubs like AAA or AARP. Sometimes credit card issuers have agreements with certain car rental companies. Your bank or credit union may also have special offers. Weekly Rentals: If you're renting a car for a long period of time, you shouldn't have to pay the day rate. Instead, ask for weekly or monthly discounts. Which Credit Cards Offer Rental Car Insurance? Rental Car Momma offers discounts to five of the major car rental companies using printable coupon codes. Retail Me Not has both online and print codes and also highlights daily deals through third party travel sites. EZ Rent a Car highlights coupons for students, military members and others in select groups. If you receive any travel magazines in the mail, check the back pages for coupons as well. You may also be able to obtain these magazines at the airport or your hotel during your vacation, or you can request one from the tourism board of the area where you plan to visit beforehand. Make sure you present your coupon when you go to pick up the car, even if you have already entered the code online. This can help you prevent any discrepancies. You can also simply call and inquire about discounts, or see if companies will match price quotes you got from other companies. The additional fees are often what end up costing travelers the most money. If you are trying to decide between two rental companies with similar prices and discounts, it may be worth comparing their extra fees. Always ask about all of the fees before you sign the rental contract. You don't want any unexpected surprises later. The biggest extra fee people incur is the rental car insurance. Car rental companies often try to get consumers to pay big additional fees for collision damage, personal injury damages or a "full-coverage" type of insurance for the duration of the rental. The charge is per day, so the longer you have the car the more your wallet will suffer. However, you may be able to avoid paying this high cost of rental car insurance. Start by calling your regular automobile insurance representative. Many policies will cover a rental car, so find out the level of coverage. Often, you can forgo any additional insurance and still be covered completely by your existing policy. If you are not covered, or are insufficiently covered by your auto insurance policy, check your credit cards. Credit cards sometimes provide rental car insurance if you use the card to pay for the rental. You also have the option to simply decline the rental car coverage and drive carefully, but remember that no coverage means you are financially liable for any damage to the rental car. Ask about all the extra fees before you book your car rental. If you need a pick-up or drop-off at the airport or hotel, you may be charged for it. See how much the fee is and consider if a taxi or a shuttle bus would be cheaper. Also, inquire if will be charged a mileage fee in addition to the per-day/week fee you are already paying. Some will charge mileage in addition to a flat rate if you go over a particular amount. However, this is not that common. Bring your own GPS and child car seat or booster chair. While the rental car company will be happy to provide these items for you, they are not cheap. The last thing to do is find out how much gas to return in the car. You may need to return it full or you'll be charged an incredibly high fee for them to fill it up. Other companies automatically tack on a fee for filling the tank, meaning you waste money if you bring it back with more than a quarter or half-tank. A prepay option may be good if the price of gas is going up and you have an approximate idea of how much you will use, since it gives you the option of not having to stop for gas before returning the vehicle. Rental car prices are always open to negotiation, especially if there are a lot of cars on the lot. Although the employees may tell you different, rental car places typically do not have set rates on their vehicles and can almost always rent for cheaper than what is posted. Simply ask at the desk if you can get a discount off the posted rate, or ask to speak to a supervisor to negotiate a lower rate. If you don't care about the size of your car, always book the "economy" size beforehand instead of simply showing up. If the rental place is out of economy cars (which is common), you can get a larger vehicle for the same price. If you receive your bill and it is higher than you expected, call and complain. You can likely get some money knocked off the price at the back end. Don't forget to look online to find cheap gas prices in the area you will use the rental car. Make these purchases with a gas rebate card to save even more money. Drive carefully; paying to repair a rental car is an unexpected expense that can ruin your budget.